The type of work that we do at Ludus is more clowning than pantomime; not circus clowning but character clowning. Our process of work starts with the conception of a scenario. Next, independently of the scenario, we work with the players to create and develop their clowns through improvisation and clowning exercises. By creating we mean not only causing to exist through imaginative endeavor but also bringing into being by searching and discovering the clowns that inhabit a player. 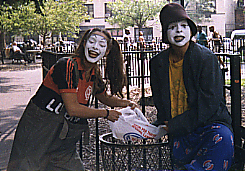 Once the clowns come to life, they are placed in situations relating to the scenario and adjustments are made to allow for the integration of clowns and scenario. Although the scenario stays the same, it will produce a different script for each different set of clowns playing this scenario. Improvisation is the basic training for players. If one has forgotten how to play, it's through improvisation that one will re-acquire this ability. It's a game. One plays. One must destroy the logical thinking that interferes with playing. If one thinks when playing, this thinking must be part of the playing. The principles we apply to creating a clown, with a few exceptions, are the same principles we apply to creating a character. There is no psychology involved in the first approach to a character. There is only flesh. One does not ask how a character feels. One explores and finds out who the character is. It is form, not content, that makes art. A character is a mask. The character is not the player and the player should never refer to the mask as herself or himself. The player's body acts like a lens that captures light and presents it to another dimension. Economy is essential. When creating a character, one should concentrate in descending order of importance in the following aspects of the character: body, actions, interactions, sound of voice, wardrobe, makeup, words (gibberish for speaking clowns), emotions, motives, intentions and text (not for clowns). Motives are what cause actions. Intentions, or objectives, are what guide actions. For instance, Clown is hungry (motive) and wants to stop hunger (intention), so Clown eats a banana (action). From body to emotions are the aspects of the creation of a character that are independent of the role the character is playing. The last three aspects (motives, intentions, and text) are part of the role this character is playing. Sometimes players wish to work with clowns that they have already developed. This can be effective if all the players in the troupe have already their clowns and if there are not large stylistic gaps between each clown in the group. Otherwise, it may be artistically desirable to start the process anew. A player is a creative being with unlimited resources to be explored. A fresh start, the empty mind, is a wonderful challenge. To meet this challenge is many times to be able to let the Creator express herself through the player. The great pleasures that we have derived from directing have come from watching with amazed eyes life unfolding in front of us through the work of a player. Although this process sometimes can also be painful, we see no other manner. We am interested in the way beings relate to and communicate with each other. Particularly we are concerned with human expression that attempts to communicate without words because of its ability to convey that which with words can only be touched by poetry. Pantomime and clowning are exceptional media for such. Theater, with the proper placement of words, can reach similar realms as Greek and Shakespearean tragedies attest. Since theater relies on words, it must communicate beyond the obvious. It is of no relevance if what is being experienced is liked or not (a matter of entertainment), agreed with or not (a matter of philosophy), or even profitable or not (a matter of economics), if what is being experienced does not communicate past what is evident. A great mime/clown, with a simple gesture, will marry laughter and pain, and one will understand what thousand words cannot explain.